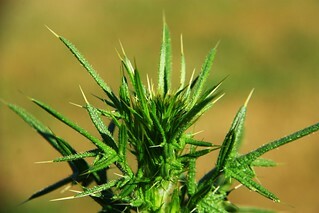 Thistle is a weed. 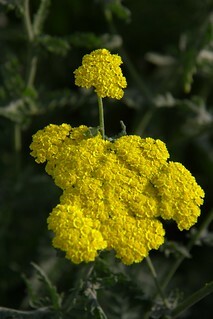 It’s invasive, grows very quickly, and has the potential to choke other plants which are growing around it. 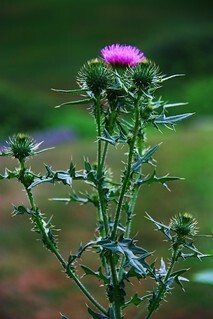 Prior to our trip to Maine, I noticed some thistle growing right in the middle of our front yard hedge. 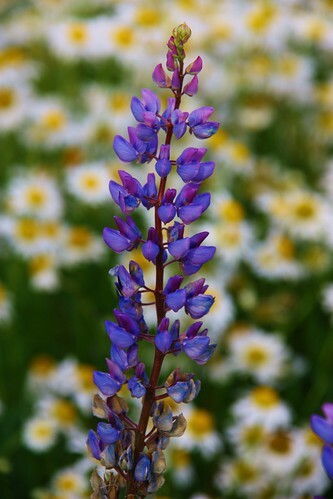 The flowers had not yet bloomed, so I asked Ray to allow it to stay there – just until the flowers bloomed so I could get photos. 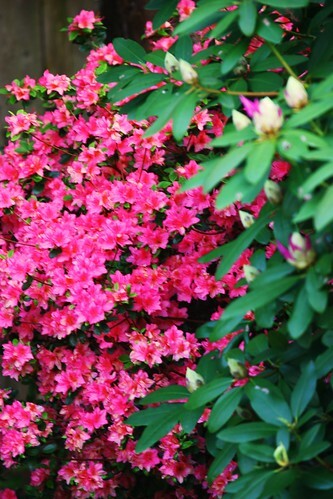 Days after we returned from Maine – the pink flowers appeared…. 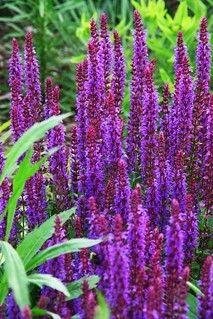 It’s such and interesting plant in that the leaves are so full of prickers and sharp as a tack, as you can see in the second photo below! 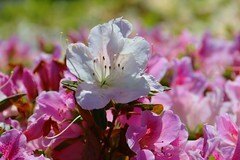 But – the softness of the pink bloom is like a kitten’s fur! What a dichotomy! 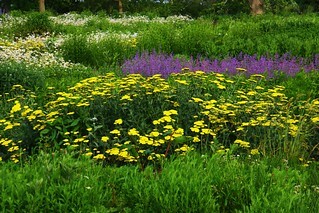 It is a wonderful place for bees, butterflies, and the goldfinch! 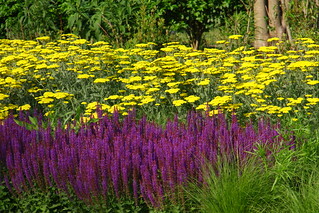 Only hours after these were taken, Ray chopped down the thistle. It was kind of weird looking growing high above the hedge! It was sad to see it go, knowing that wildlife thrives on it. We’re renovating our computer room in our house — removing the 35 year old lime green shag rug, and replacing computer furniture, removing an old single bed, and replacing that with a futon, and we will be redoing the hardwood floor and repainting this winter (when we’re gone). 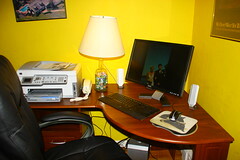 It will be so good to get rid of that terribly bright yellow paint….! 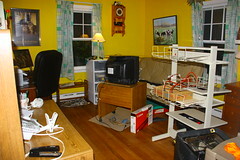 Here’s the room in the midst of the chaos of the task! 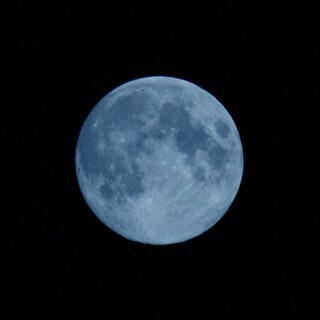 Blue Moon – August 31, 2012! 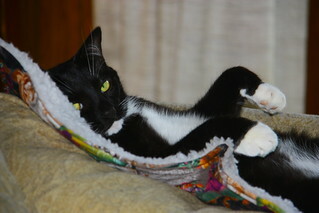 Felix – silly kitty loves to lie on his back! Mundane life is about to end, however. In 2 days I’ll be headed to Claire’s – and then she, her husband and I will be driving to “Crane Fest” in Wisconsin. This is Operation Migration’s annual gathering where events are scheduled like a dinner, wildlife refuge tour, auction, and annual meeting for Operation Migration, and I don’t know what all else. I’ve never been before, so I’ll find out! I have decided to go – but didn’t want to go alone, so am tagging along with my good friend Claire, and her husband. I have spoken about this organization here in previous entries (here and here) during their crisis with the FAA and flying the ultralights. So – – stay tuned for an entirely different set of photos from my next adventure. If I can post while gone, I will, but otherwise, I’ll be back in early October to update! After returning to Long Island from Hilton Head, we had less than a week before heading to Maine for our annual vacation there. It was hot – and most of my photos were taken inside. 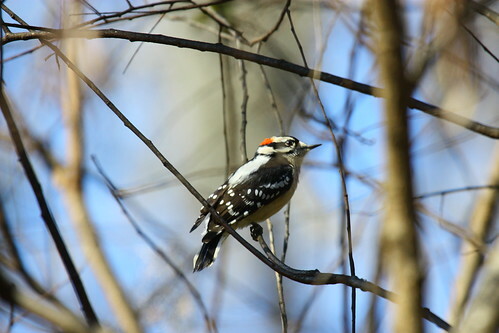 With all the travel, bird seed had run out of our feeders, and I decided not to refill until we returned from Maine. I think it was during this time when I found myself beginning to go into a funk, and my 365 photo project began to unravel. I was both looking forward to our trip to Maine, yet dreading the process of getting there — the packing, the meal planning, settling in in camp, etc. 1. On the day we arrived home from Hilton Head, I noticed there had been quite a bit of growth from INSIDE the front yard hedge – – some thistle weed. 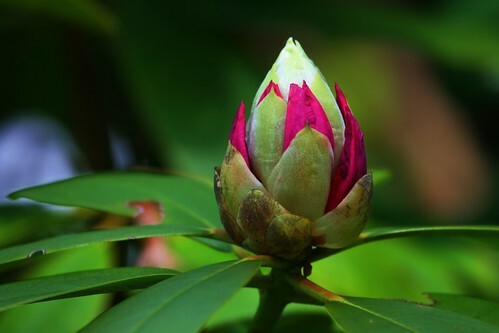 This photo was taken prior to the flower’s bloom, but I’ll have photos of that later. 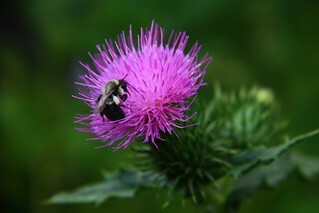 Thistle is not something you want to nurture, as it can choke other plants. Yet, I find it so pretty. 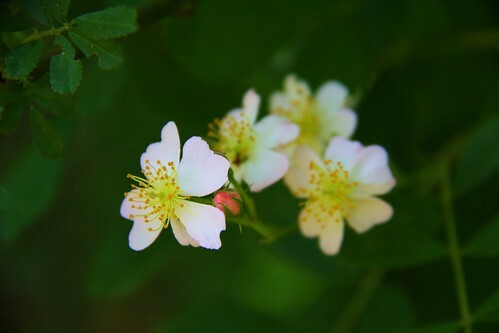 The entire plant is full of thorns, but the flower, itself is soft – and perfect for bees, butterflies and even goldfinches to eat from it. I asked Ray to leave it there – at least until the flower bloomed so I could get a photo of that before it was cut out. 2. 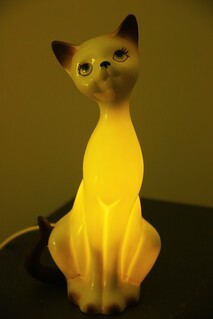 This is a night light lamp which was given to me as a gift by my parents when I was a teenager. Earlier, I had fallen in love with a very heavy lead crystal night light which was my mom’s that had once belonged to her mom (my grandmother). She knew I loved it, so this was what she gave me – knowing I’d like the soft light that would come from the body of the porcelain Siamese Cat! 2. 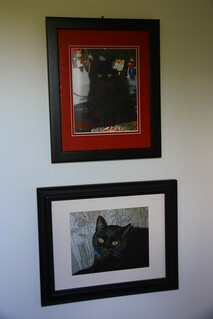 Photos of Shadow (above) and Phantom (below) who were our litter mate duo prior to Misty and Felix, hung in the front entryway. 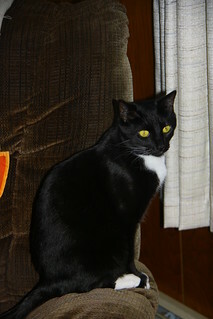 Phantom died November 29, 2006 from an inner ear tumor, and Shadow died on December 1, 2010 from kidney failure. 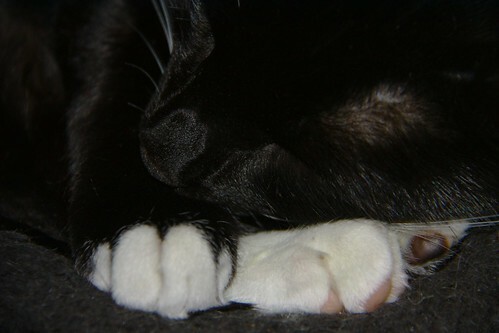 I still miss them a lot… They were such good kitties. You can see another photo of them together on the right column of this blog. 2. This is a Moravian Star, which was given to me on my 50th birthday from Ray and my mom. It is very special, and there is a light bulb inside, so when lit, it has a stained glass affect. When I took this photo, the light was not lit, but the daylight from the window where it is hanging was shining through it. I learned to love Moravian stars because our son went to Moravian College, located in Bethlehem, PA. 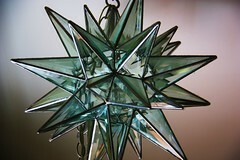 These special Stars are commonly hung in Moravian homes at Christmas time. 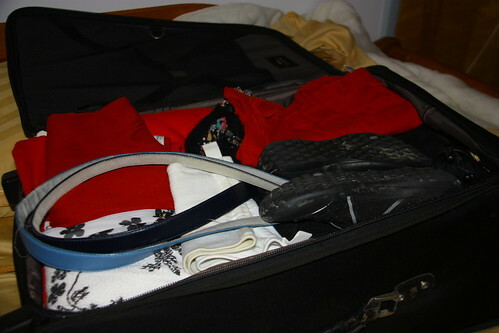 It was the day before we left for Maine, and Ray was packing his suitcase while I was out doing errands. 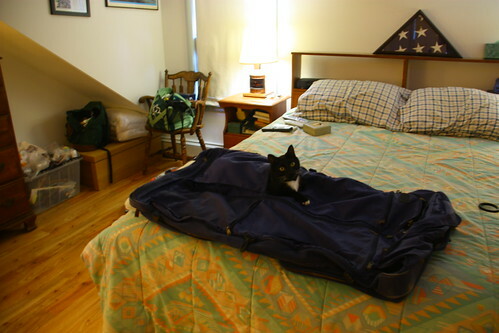 Little Misty – seeing the suitcase on the bed – wiggled into an outside pocket of the suitcase and posed for a picture which Ray took with my camera. It’s as if she is saying … “Don’t go! Don’t leave me! Take me with you!”. Made me sad, as it’s always hard to leave my kitties when we go away, even though I know they are well cared for by our pet sitter. Next post(s): Kezar Lake Maine! Let’s see if I can catch up … only to get behind again! Tomorrow I’m leaving on yet another trip. Due to needing to go to PA because of my mom’s illness in March, I was unable to visit my good friend, Claire in North Georgia. At that time we were planning to do a spring piano / flute concert in her church. She ended up doing the concert alone, and I can’t redo that experience. However, I can finally do a visit, and I am leaving for her house tomorrow. Among other interests we share, we both are photography enthusiasts, so I will have lots of different photos to share for my daily 365 photo during my visit. 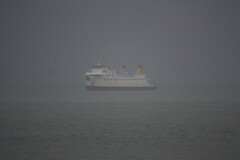 I”m looking forward to the change of scenery and some different kinds of photos from a different area. 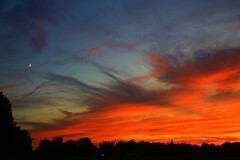 Claire lives in a beautiful area, so who knows what my subjects will be for my photos!! 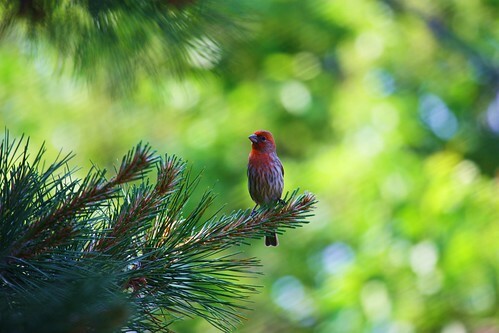 365 photo #150 – (May 29) – House Finch in the black pine staging area for the feeders. 1. 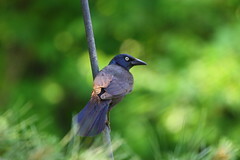 Grackle – kind of a bully bird. I feed the birds only safflower seeds mainly because the grackles don’t much like it so they are less likely to be around to bully the smaller birds. However, they try…! 2. 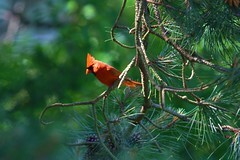 Male Cardinal in the black pine “staging area” of the bird feeders. 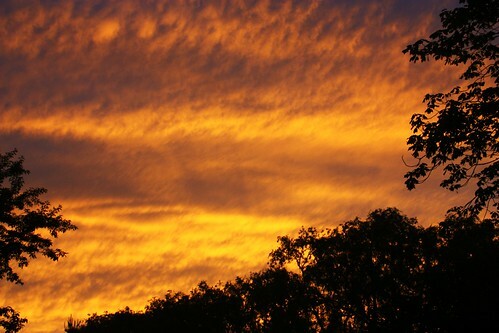 365 photo # 151 (May 30) – a gorgeous sunset which gave the world an orange glow for a bit! 365 photo #152 (May 31) – I believe these are crabapple blossoms which grow wild around our yard and neighborhood. 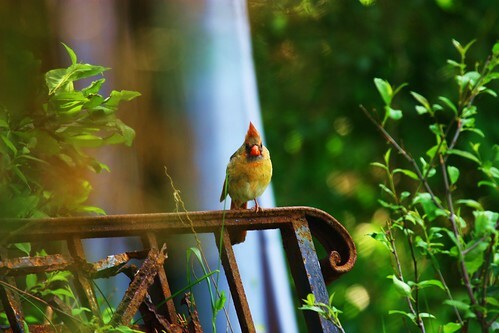 365 photo #154 (June 2) – Female cardinal hanging out on an old wrought iron railing that was placed there after being removed a very long time ago. I had forgotten it was there until I saw Mrs. Cardinal there that day. I can’t believe it hasn’t been pitched, as it was from a patio that has long since been transformed. 1. 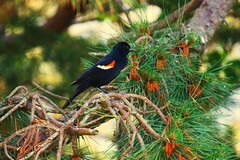 Red winged blackbird — Sometimes they are “bully birds” to the smaller birds, but they are so pretty, I think. 1. 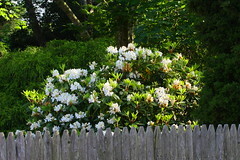 White Rhododendron. 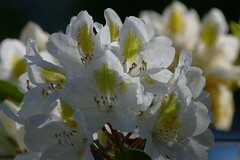 The white ones are the last to bloom, so these flowers are almost done for the season. They are so pretty and am always sad when they’re done blooming. 365 photo #155 (June 3) I don’t know what this purple flower is, but blurred in the background is a large area of wild daisies. And — that brings me up to date. I don’t know how well I can keep this up while I’m gone, but there will be photos for those days to post later…. 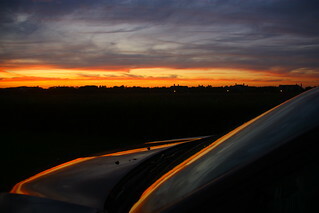 Our trip north was when things deteriorated with my 365 photo project. I’d planned to quick run out and take one last photo of the lagoon the morning we left Hilton Head. I went to get my camera, which I’d placed in the “staging area” of our living room – but my husband had been ever so vigilant – and the camera had been long since packed in the car – and buried under a multitude of other things. There was no way I could unearth it for the photo… 😦 However, when I ran out to remove the bird feeders (which is such a sad job for me, so I wait to do it at the very last minute — the morning we are leaving), there was a most magnificent Great Blue Heron walking right on our lawn along the shore of the lagoon. I stopped short and looked at him — and “snapped the photo” in my mind. If only that camera was with me… I looked at him squarely in the eye — and he looked at me. 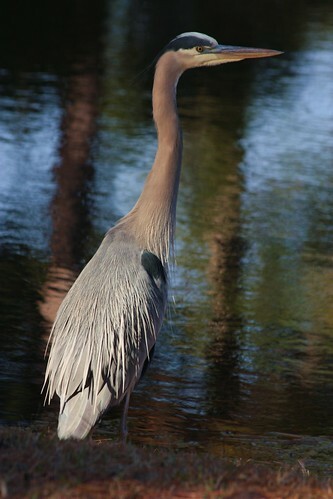 I finally said … out loud, “Goodbye sweet Great Blue Heron, I will miss you so very much. I’ll see you in the fall.” Yeah — I know … I’m sappy. I thought my voice would scare him and he’d fly off – but he continued to look at me even as I said, “I love you sweet birdie”. I don’t know if he/she was the bird who belonged to the nest we had in our yard this spring, but I also thanked him for allowing me to see his nest while he/she raised his/her babies. He continued to look at me, but then started walking slowly across our yard — and faced the lagoon – fishing, as always. The following day was a complete blur, and once my camera was unpacked, I was way too exhausted to even think about a photo of the day. 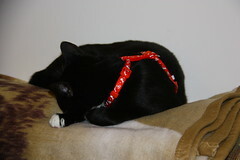 These trips north (or south) with the cats are tiring, and fray my nerves. I need to remember that they always end up fine, and that it’s my lack of confidence in the entire process that makes me nervous. 365 photo #132 (May 11) — Finally a photo was taken. This is a mirror which we purchased from Lori Wilkinson, a vendor at “Springtime Made in the South” in February. Check out her website to see more of her wonderful work! I knew when I purchased it where it would go – in the dressing area of the bedroom. 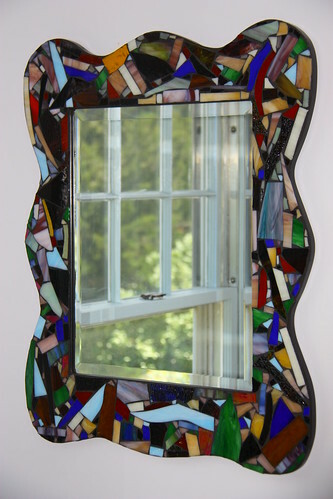 It’s made of a lovely color combination of mosaic tile and it’s gorgeous. You can see the reflection of the window to the back yard in the mirror. 365 photo #134 (May 13) – a sparrow of some kind – – I hope not a house sparrow, as they are the arch enemy of bluebirds and bluebird nests. 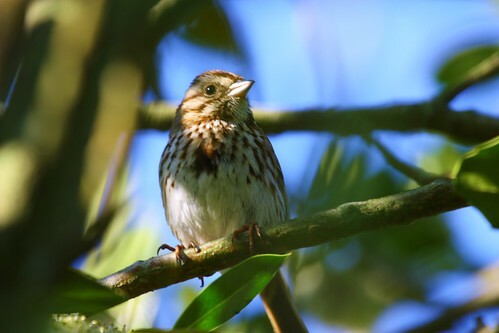 I think it’s a song sparrow, though, and it was singing it’s heart out the entire time I was snapping photos! It was taken – by chance in one of our bushes. Our feeders were not yet up at this point. 365 photo #136 (May 15) – Sweet Little Misty kitty. I almost forgot to take the photo that day! 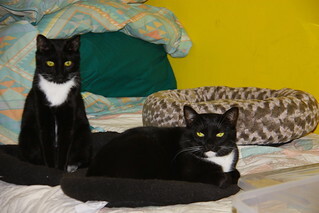 The cats have made themselves at home in their Long Island home! 365 photo #137 (May 16) – the rhododendron buds are are beginning to bloom! And .. with that I will end for this entry, but will continue with the catch-up soon…. Stay tuned! Yesterday was “kitty day” at Chez Sweetmeow. 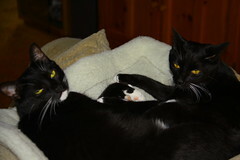 It was time to take Misty and Felix to their annual check up at the vets – always an interesting adventure. Getting the kitties into their pet carriers (without one of them going under a bed where they are nearly impossible to get) takes strategy and finesse. It’s about outsmarting them. We were successful (humans: 1 … kitties: 0), and off we went – on time – to the appointment. It’s always good when Ray is around to help with this endeavor. Thank you, Ray, for being there! 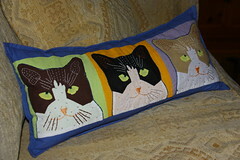 On the way the kitties meowed – separately, and together in chorus. We put them into the car with their carriers facing each other so that they could give each other comfort – but I’m not sure that happened. Meow meow. Meow meow. Interesting to note when the two kitties meowed at the same time how much lower Misty’s meow is from Felix’ meow. It was good that we only had about 25 minutes on the highway with them. The vet visit was short and sweet – just two shots for each – a quick check of weight and teeth and off we went – back to where we’d started. 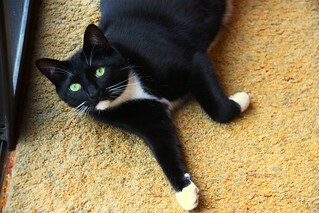 Felix is not overweight as I’d feared, but is simply a big boned kitty of 14 lbs.! Misty is wiry and petite coming in at a slim 8 lbs. Both both are fine for their body builds. 2. 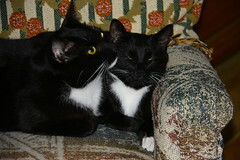 Finally the cats curled up together – paws around each other, and licking each other’s neck. Sweet! Today was crystal clear after a few days of clouds or mixed clouds and sun. It was a perfect day to go to the Whooping Crane Conservancy down the street. 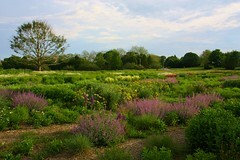 This is an area of woodsy marshland that has been designated to remain pristine in it’s original state. A boardwalk has been built so that one can walk through and be in the midst of it all. 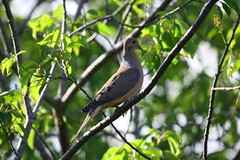 On the brochure that describes this conservancy, it says that it’s named for this endangered bird (that I love so much!) that may have lived here at the turn of the century. However, I’ve also read (and I can’t find where…) that people, who thought they were seeing whooping cranes, named it after that bird. However, in reality, they were seeing wood storks. Today’s photo was purely an experiment. I’m not sure when, but the camera club will be having a photo competition on the topic of “windows”. We can interpret that in any way we want, and I’m trying to figure out which way to go with it. I’m always intrigued by the reflections I can see through the windows as I stand outside looking in. 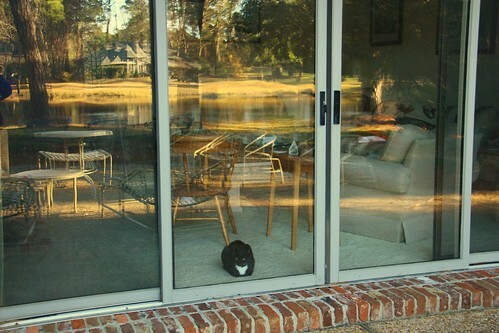 In this photo you can see both the objects inside, as well as the reflections of the lagoon, the patio furniture, as well as other back yard things where these windows face. Of course I made sure that front and center there was a kitty (Misty) inside looking out. Do I like the result? Uh – probably not enough to submit it! The photo seems a bit cluttered to me, like there is too much going on. I need to experiment a little more with it – or go another route. However, I’m making it today’s photo because this is what I was doing with photography today. Watchful eye – bird and cat! 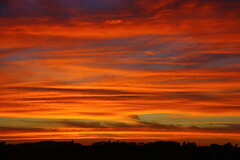 Yesterday I, again, had not gone out to get a photo. It was cold and windy and I wasn’t in the mood to just hang out. We have our friends, Claire and Terry visiting for this week, and Claire and I just hung out on our computers and watched the lagoon from inside the warm house. 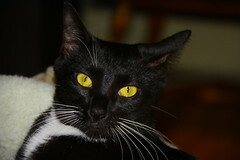 So — when I realized I had not taken advantage outside photos, I resorted to one of my favorite inside subjects: my cats! 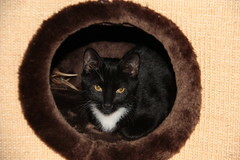 This is little Misty (sometimes referred to as “Misty Moonlight”!) – all curled up on “The Black Bed”. She had a very watchful eye on me and my camera lens, as she is definitely not a fan of having the “black box” shoved in her face, just so that I can have a photo op. I have to be quick snapping the photo as it doesn’t take her long to turn her head, get up, yawn, get up and lie down with her back to me, or some other avoidance tactic. Today I did get outside for some picture taking so I’ll include today’s photo of the day. Across the lagoon from us is a golf course hole. 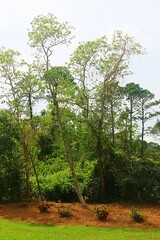 In the very top of the tree right next to the hole is a huge osprey nest. We watch it each season we’re here as they build it, repair it, then they raise their babies in it. There are no eggs or baby ospreys now, I don’t believe. It’s still a bit too early. 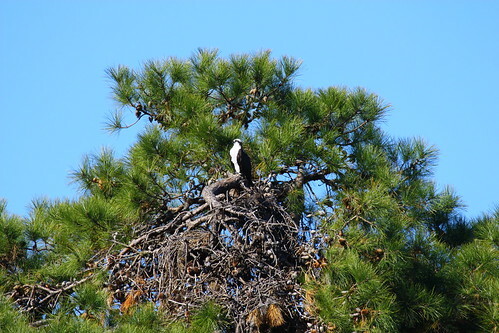 However for several HOURS, this osprey stood at attention in his / her nest. Not sure what he was doing, but I think he was “visually” fishing. I’ve heard that ospreys have amazing eyesight and can actually see fish under water from great distances. Sometimes I watch the golfers on that hole, and I have never seen ONE person notice the spectacular birds that live just above them while they are playing. Interesting to see how man and wildlife can peacefully co-exist. We have returned to Long Island from our wintering in Hilton Head a few weeks ago, and life sure hasn’t stopped so that we could relax. 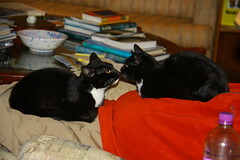 First of all – our trip home was nerve wracking as we had our new kitties with us who were untested for long travel. I worried for weeks prior to leaving about all the things that could go wrong. Traveling with Phantom and Shadow was not easy, but they were more calm and quiet in their older age. 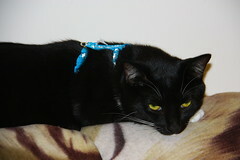 Since we did not know how this would play out, we purchased little harnesses for the kitties so that if we had to have them out of the carriers (like for a cat box break), we could control them easier with leashes. One can’t do that with a collar, as it’s not good to pull against a small kitty’s neck, besides the fact that most collars are “break-away” in style, and would easily pull apart if pulled. We test drove the new harnesses a week prior to leaving. They were not amused and spent countless hours trying to get out of them, by backing up (thinking they could back out of them), rubbing up against a wall (thinking they could “rub” them off), and hopping around (thinking they could shake them off!). 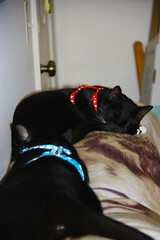 Finally they settled in, thinking they if they went to sleep, they’d wake up and the harnesses would miraculously have disappeared. Ultimately they did get used to them … sort of! 1. 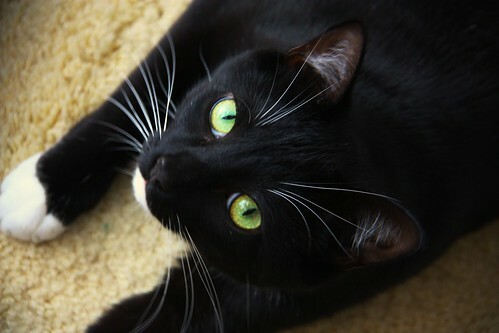 Felix – check out those sad eyes…! The trip itself was a lot less traumatic than I’d imagined, and we made it back in one piece, though all of us – including kitties – were exhausted. Felix had one huge kitty tantrum at the Maryland House, when he went on a meowing jag, and flung water and his carrier “mat” all over the inside of the carrier. We gave him a “cat box” break, but that was not the problem. 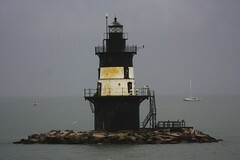 In fact – once out of the carrier, he begged to return there to his “safe haven”. Once we got back on the highway, he settled in again, probably exhausted from said tantrum! Misty also scared us once, thinking she was actually dead! She had pulled her carrier mat up over top of her, so she could not be seen, and was so sound asleep that she didn’t rouse when we stopped the car. We shook the carrier and she finally opened her eyes with that “wtf” look on her face – no worse for wear. However, there was no rest for the weary once arriving home. In short: the house was not as we had left it. In all fairness, the hassles were nothing we couldn’t handle. 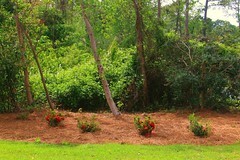 Many who have withstood tornadoes would trade their tragedies with the small inconveniences we endured. But – we were tired from our travels, and it seemed worse than it was. 2. Our house was burglarized in early January, and the perpetrator came in via our computer room window. Our security system paid for itself, as the alarm went off after only a minute of him being in the house, and after taking almost nothing, he left via the window where he entered. Again, the person who cleans our house returned the room to “order” and worked to clean all that black finger print dust off objects (or threw out the things that could not be cleaned). But – again – stuff is not where I’d left it, and things are still missing, even a few weeks later. Despite the confusion, I am eternally grateful to my cleaning gal for all that she did. 3. Our swimming pool’s liner was leaking when we closed up for the winter, but it was worse when we realized that it also included the pool steps, which also needed replacing. That job could not be done until the weather got warmer, so it was barely started when we arrived home. 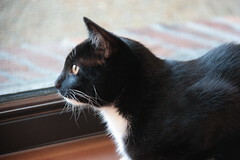 As the weeks have gone by, we now feel more at home in our house — including the cats. The pool is nearly done and our two upstairs rooms now feel like home. It was also fun watching them claim their new habitat, so that now they have new favorite places to sleep and play. It was clear that Felix and Misty had never encountered stairs before in their short little lives, and Felix didn’t quite “get” what gravity would do to his method of going down and he literally fell down the stairs. The “what the hell just happened” look on his face after that happened was priceless. They both learned quickly, and I can’t believe how fast they maneuver the stairs now. 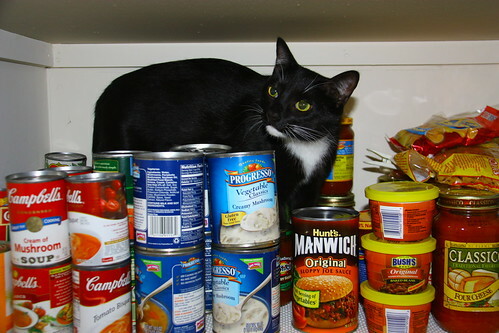 They love our pantry – looking for good things to eat! Since I’ve been blogging, there is a “truth” about the process which has become very clear to me: The longer you go without making an entry, the harder it is TO make an entry! “Time” brings on “mind clutter”, and one has to wade through that in order to write something. It’s my theory of chaos in all facets of life. The more clutter there is, the easier it is to run – head firmly planted in the sand – away from that chaos which becomes increasingly hard to fathom. And … so … with that in mind, I return again to this blog that clearly was in danger of being left for dead with resolve not to let the chaos overtake me. I also believe that in the blogging world, there is very little tolerance for long term (or even short term!) “negativity”. It’s ok to mention negative things, or have a “down” post once in a while. However, ultimately a positive spin needs to be put on these things. But a “negative blog” just doesn’t work. When in the midst of situations like this, I become overwhelmed – almost “imprisoned – by the depressing mood of the moment – so much so that putting a positive spin on it when writing becomes difficult. I need to work on seeing the larger picture – even when in the midst of difficult, negative life issues. Which brings me to the issue of my silence…. It was a rough fall and early winter for me. When I left you in mid October, things were going downhill. After a power walk, motivated by my blog entry on my need to do something about my weight, I blew my knee out. I wrote a few more entries after that, but my momentum was sorely lacking. I quickly got an appointment with the orthopedist. His diagnosis: a torn meniscus – but not a serious one which would require surgery, He recommended physical rehab. For the month of October into November, I put my heart and soul into it, and my knee improved greatly. I totally enjoyed rehab – but in all honesty, I do not know if the improvement was as a result of that. It didn’t matter why it was better, as long as it was. I looked forward to returning to the state where I would not have to think about my knee every step I took. There was – and still is — the undercurrent of fear that I might injure my knee so that I’d lose forever the ability to do the activities I take for granted: photography jaunts, golf, and just routine errand running! 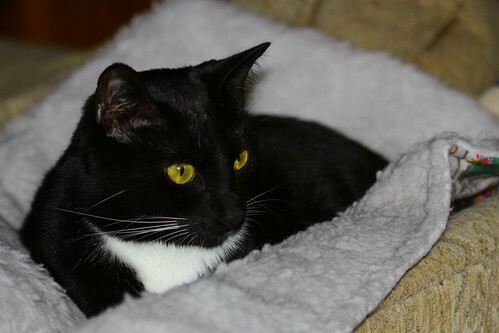 In the midst of this potential loss, another loss was looming: Since November, 2008 we had been giving our sweet black cat, Shadow (that you see in the icon above) subcutaneous infusions as a result of kidney failure, which is common in older cats. There is no cure for this, so the reality is that her condition would only worsen with time, but she did so well for little more than a year and a half. 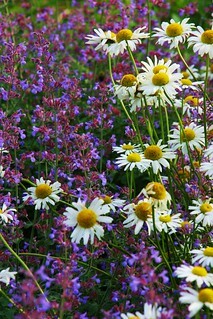 During the summer – almost imperceptibly – she began her decline. Her eating and activity level lessened. She was slowly losing weight almost without notice. I think it was the brutal heat we had over the summer, and without our house being air conditioned, it’s my opinion that this took a toll on her. By September, it was clear she was not doing well. She was lethargic – barely moving from one spot both day and night. Watching this was like watching a slow death – and I knew this was what was happening. The chronic sadness about this took it’s toll. We had to return to Hilton Head in late October for a few days, and we boarded her at the vets instead of getting a pet sitter so that she could be watched more carefully. That was a tough decision because I didn’t know how well she’d thrive being cooped up in a cage in a strange place, but she did ok, and we brought her home – maybe a little better from that experience. For the month of November her health remained constant, although I suspect that she was declining still – again imperceptibly. Again we had to board her over Thanksgiving while we visited my family in PA, but this time she returned home clearly more sick. She was barely eating – and was skin and bones – only 6 lbs. 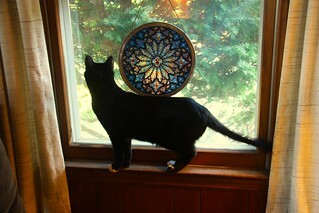 on her rather large kitty frame. It was our plan to leave for Hilton Head for the winter about two days after returning from our Thanksgiving trip. It had been our plan to take Shadow with us. But – her condition was dire. 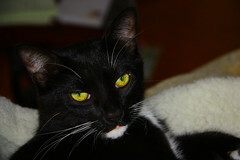 We had vowed that we would intervene in Shadow’s health only as long as she had “quality of life”. After Thanksgiving, however, it slowly became clear that this had ended. I wasn’t even sure she would survive the two day car trip to Hilton Head from Long Island. Would we be putting Shadow down only for our convenience – so that we could go to Hilton Head at the time when we wanted to go? Those few days after our Thanksgiving trip were dark ones for both my husband and I as we wrestled with the decision. What to do? What to do??? On December 1, we put Shadow down. It was one of the saddest days for us. But – in the end, both of us are convinced we made the right decision for her. She had no quality of life, with little hope for it to return. 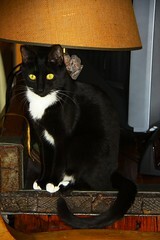 We loved her – and her brother, Phantom (who died in November, 2006 of an inner ear tumor), deeply. They were our “dynamic duo” – so special in our lives. 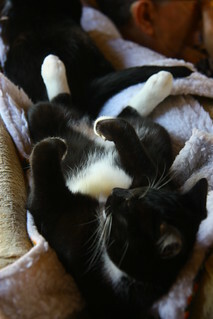 No matter what other kitties would grace our household again, there would be no kitties like them ever again. It was an end of a wonderful era…. Emotionally I was “in limbo” during the month of December. I was healing from the loss of Shadow – or trying to – by preparing for Christmas. We decorated the house, shopped both online and in the stores, and prepared for a trip to PA on Christmas day until December 29th. But in the midst of all that, my knee went “out” – yet again — during a photography walk on the beach in mid December. Add to that – a rash I have been battling for the last two years flared up around Thanksgiving. Let’s just say: The itching was relentless until I got a “miracle cream” prescribed by a dermatologist whom I saw only days after arriving in Hilton Head. My knee is better, but it’s now fragile in a way it was not before. I do not know if surgery is in my future, but will be waiting until we go back north (where our health insurance is in effect) to have that evaluated again. I am doing the exercises I learned in rehab, and wearing a brace when I walk. There are good days and bad days, and do not know why my knee’s condition fluctuates so much. I’m just relieved to be relatively mobile. I know for a fact that my overall mood is rising. 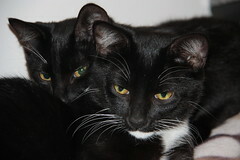 On January 7th we went to the Hilton Head Humane Association and brought home two litter mate tuxedo kittens (one male, one female, about 6 months old) which we’ve named Felix and Misty. What cuties they are, and to be honest, I knew I could fall in love again! When I saw them lick each other after removing them from the cage in the Humane Association to see how they would react to each other, I was smitten and knew they would be my kitties! After a month without a cat in our house, I have discovered that our house could never be a “home” without a cat (or cats) in it! Kittens are a new experience after having elderly cats for so long – and they are into everything. Fragile items have been put away. Upholstered Furniture is vulnerable to kitty claws. But – it’s all good! They love each other – and us – and we love them. 1. 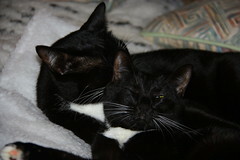 Misty (no white on chin and a smaller kitty) and Felix (white on chin and a slightly larger kitty lying together. Misty’s head is on Felix’s body. 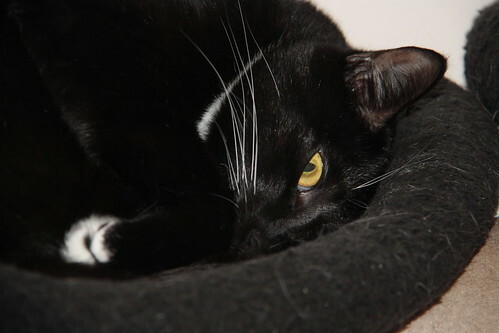 Very soon I will be changing some pictures on my blog’s sidebar to reflect our new additions – but will always keep Shadow and Phantom not far from here, too. (EDIT: This has been done) I also hope not to allow this much time to go by between entries.